Whole Foods Market Lakewood Craft Fair - March 24, 2013 — Jewelry made from fruit. Hear our latest news, stay up to date with recent events, and see how we are growing and expanding this unique line of jewelry, as we continue on this journey to bring "jewelry made from fruit" and the compelling story of these Colombian women artisans, to a community near you! We braved the elements with a makeshift blue tarp to divert the wind, all well worth the effort at this fun, well-attended event! 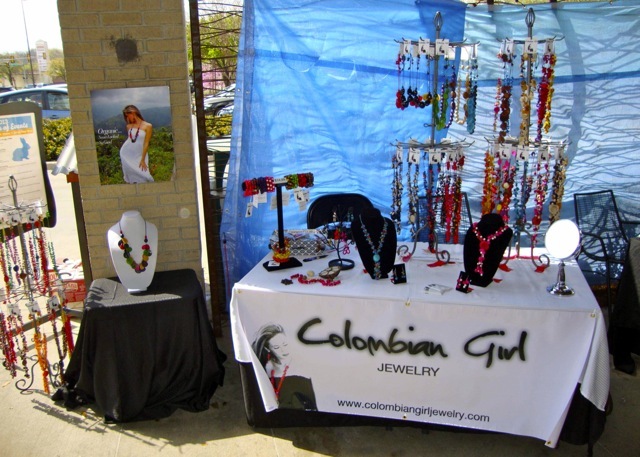 Well we braved the chilly spring temps and wind Sunday, continuing on our 2013 campaign to bring our new collection of organic jewelry to the rest of the world...beginning here in Dallas! Given the opportunity to work with Whole Foods and knowing that a portion of the proceeds go to the 2012 Whole Planet Foundation Prosperity Campaign, we felt inclined to participate! This turned out to be a fun, well attended event.